The fine people at Bridgeport told me their best selling beer year ’round was their IPA (with Hop Czar occasionally jockeying for first as well). I haven’t seen the Hop Czar yet but the IPA is, of course, all over. So let’s get cracking! Pine in the nose but nothing too strong. The beer itself reads a bit like this too; the hops have a nose slightly reminiscent of what I’d get from a commercial lager, in addition to the pine. Familiar but not. There isn’t too much malt on the tongue but despite that, the bitterness is fairly restrained. This ale isn’t flavorless by any means but it’s not very adventuresome either. Now, I have to admit that this isn’t a bad thing. If someone didn’t know what else to buy and bought this, I don’t think they’d be sad about it. I just wonder if they’d be interested after that. To it’s credit, the IPA holds up nicely over the course of the drink. The nose doesn’t falter, the head remains steady throughout and a little more malt arrives as the beer warms up. Overall, I have to say this is a solid beer, the kind that might just lure someone who IS interested in craft beer into trying something else Bridgeport does but the limitations of needing to appeal to such a broad audience means that I am not feeling the hook. The timing for this beer could have been a little better. Don’t get me wrong; when it’s hot out, cold beer is still cold and that’s hard to argue with. It’s not the most refreshing style or accomplishment on my part, though and when there is no such thing as air conditioning, that can be a little troublesome. This red ale has a floral nose–but not a strong one. The bite on the finish is pretty solid though. Not citrus and not resin either. Woody, I suppose? Good word for it. Woody is a good word for this beer all around. There’s a solidity to it. This may also come from what feels like a higher alcohol content. It sits on my tongue a bit, even after the effervescence is gone, a bit of bitterness there to linger. Looking at the numbers, this beer shouldn’t be heavy but it doesn’t feel that way so I’m wondering if I made a mistake recording the numbers. It possible but it doesn’t negate the quality of the beer; it’s still pretty solid! Just something I may want to pay more attention to next time. It has been a long, long time since I’ve been to the Moon & Sixpence and that’s a shame. The rail here is warm; pleasantly lit and wood of various shades and shine. It’s also flat, so it’s easy to rest my arms on and lean in to talk to a friend or whisper to the bartender. I should try an get into northern Portland more often. Breakside, Columbia and Laurelwood have brewpubs here, just to name a few. I can’t think of places in southeast Portland that have a similar representation. Yet somehow, the bars I want to attend are in that location. Or Bailey’s, but nobody can argue with going to Bailey’s. There’s a whole city out there to appreciate and the Moon & Sixpence is reminding me that I should get out and see more of it. I get the Lucifer belgian golden ale because of the name. How can I not? The brewery is unknown and I don’t have it in me to research it, in part because of how it tastes. It has a fruity boozy nose with feeling of warmth and flavors of banana like going down. There’s a white wine element too and I’m not sure how to identify it. Floral in some respect, that’s for sure. My friend says ‘This tastes like antibiotic cream and honey’ and I’m not inclined to dispute her. So, the Lucifer isn’t a drink I can recommend. 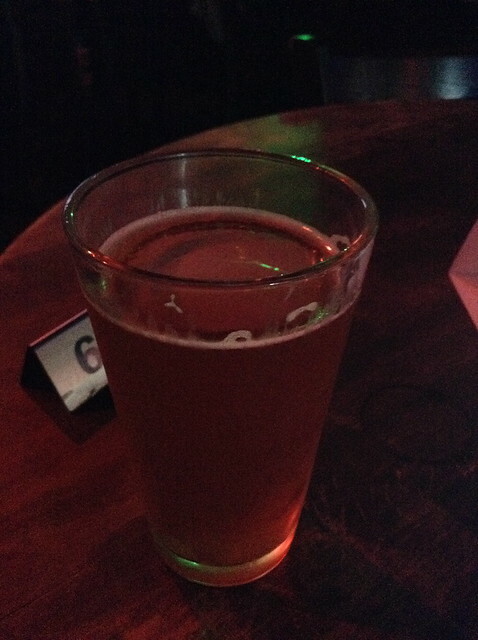 Unbalanced and not very rich in flavor; I’m about as displeased with this beer as I am pleased to be at this bar. The susurration of conversation is steady and lacks the boisterousness that might be present at another bar. Right now, it’s a good thing. I’m still recovering a bit from the PCBF. Long day, heat, beer means that going somewhere that would be intensely lively just doesn’t suit my mood. If it wasn’t for the Decemberists playing in this bar, I’d say that there’s practically zero hipster presence here. But I can get over the “we play accordion because Portland” songs for a night. 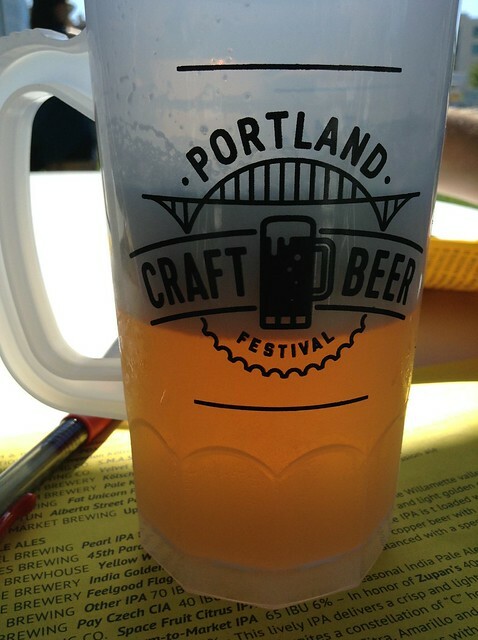 So the first Portland Craft Beer fest seemed to kick off well! There were a lot of people and a great many beers to enjoy. The only criticism I have at this point is that for next year: provide more places with shade, and provide free water. Seriously, people need water. I was lucky because I got there early and camped out at a table so I had a place to write and some shade. Other than that, I had some pretty tasty beers so let’s get to the notes! BTU Brasserie Ghost Man White Lager-grassy nose, light, the beer is sweet and light, with virtually no aftertaste. It’s a solid starter beer, especially after standing in line for 20 minutes to enter the event. Columbia Brewing ESB-floral hops on the nose: slightly funky. Smooth beer though, hint of chocolate sauce there, finish is very clean. Gigantic Ume Umai Lager-nice rice silkiness. The nose is quietly floral and there isn’t much in the way of plum quality but it’s very light and very refreshing. I wanted more of this. Breakside India Golden Ale-has a pronounced sweetness in the middle and the bitterness on the finish is a mild grapefruit. I can get behind this level of hop bitteness; once again Breakside does not disappoint. Humble Lo & Behold-this is a saison sending me mixed signals. Initial scent is sugary, but…the beer itself is tart, shy even of a sweet tart candy but nicely so. There a bready note after all of that which I dig on. I could have a full pint of this and I can’t say that very often about tarter beers. Royale Unicorn pale ale-the nose of it totally reminds me of marijunana. The midrange is a bit thin and the finish goes malty first before rising up into hops and I like this but…I could do without the chocolatey note. Still, it’s a decent beer and I’d like to try it again. Stormbreaker Red Storm Rider-This is malty and tasty. It also has a smoothness on the finish, because this beer is malt forward and it knows it. Baerlic Eastside oatmeal pilsner-I should have potato chips to compliment this beer and I should have all of them. 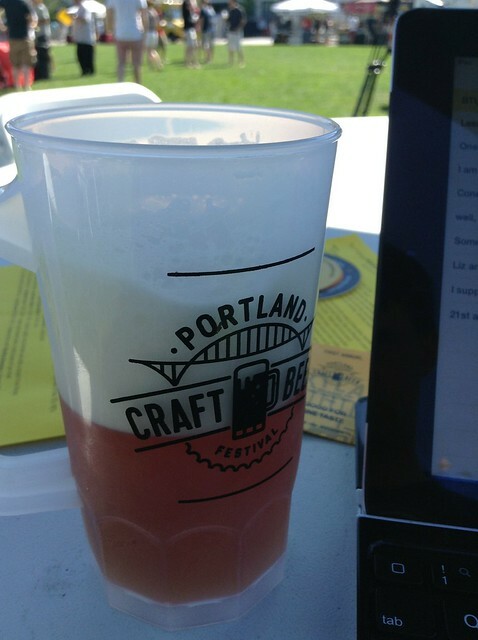 Portland Brewing Rose City-this wasn’t on the menu, but apparently the beer is brewed for the Rose Festival. And it tastes bland and forgettable, I can’t pick up any flavors to make it worth talking about. Overheard: “You never had haggis? Oh dude…” (There was no haggis at the festival that I was aware of). Lompoc Saison de L’Evolution-smells like a saison, funky, hint of fireplace but it’s a saison. And it’s good. On the very, very end there IS a touch of dryness that helps but it’s not as thirst quenching as I might expect it to be. That said: Who cares? It’s a nice beer and very, very drinkable. Pyramid H7 IPA-A solid beer and made for the masses. That is a detriment only insofar as where your expectations are set. It’s got a pleasant floral nose, the finish is bitter but not sharply so. All & all this is a nice beer that should be given a shot. 13 Virtues Rip City Red-this did not have a great nose and the taste follows; it’s hinting at vegetal and the mouthfeel is thin. Nope. A misstep from a brewery I usually like. That’s not true. I just took the title from a song, because I like to do that sort of thing. What is true is that I started to encounter a problem with getting beer from a corner store. It was a game of roulette and with my last few beers, I repeatedly lost. I am at the Knitting Factory and I’m nervous and alone and there’s nothing for me to do but wait for food. 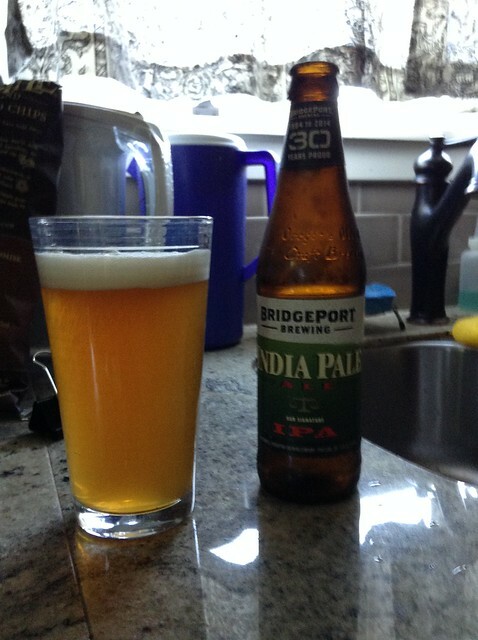 So I get the Smuttynose, a pale of some sort…and this beer isn’t bad! It’s not brilliant but it’s not bad. The nose isn’t a lasting one but it is there, faint hops & spicy before I take a sip. 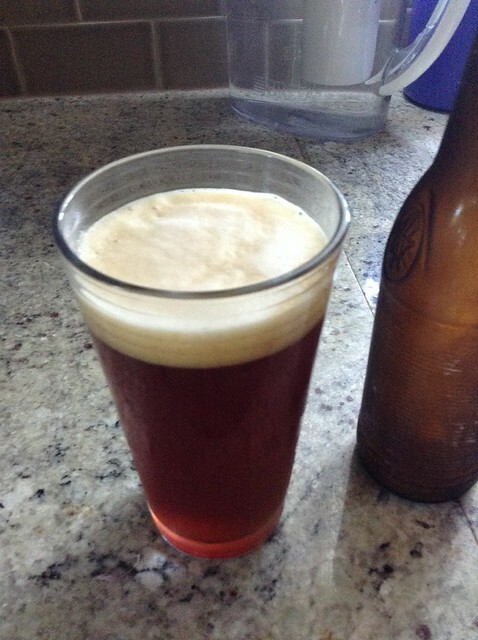 The finish has a bit of spiciness too; could be there’s a little rye malt in there because the beer finishes dry. It’s a nicely drinkable beer, even if it isn’t outstanding. It takes a few sips for me to notice a little sweetness in the middle but it is there, helping to put a little weight on the other end of the flavor scale and that’s a good thing. 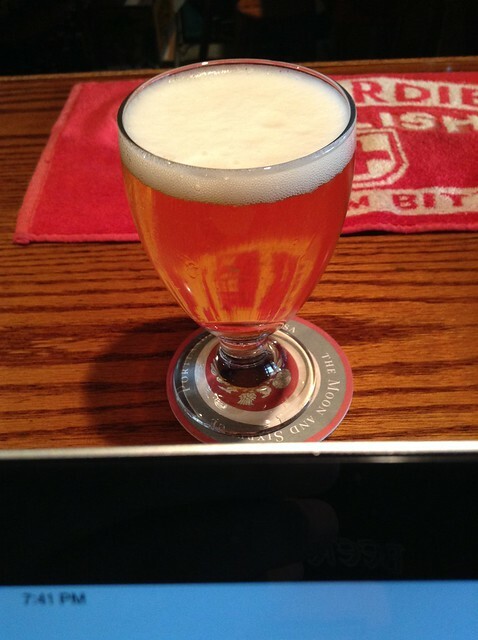 Keg & Lantern Green Eyes IPA: I went to this brewpub and this is a REALLY nice beer. What makes it? The middle. It looks really light but there’s a solid bready sweetness to the middle that introduces the citrus bitter finish. The menu says it’s brewed every 14 days and it has the fresh taste that convinces me that this is the truth. 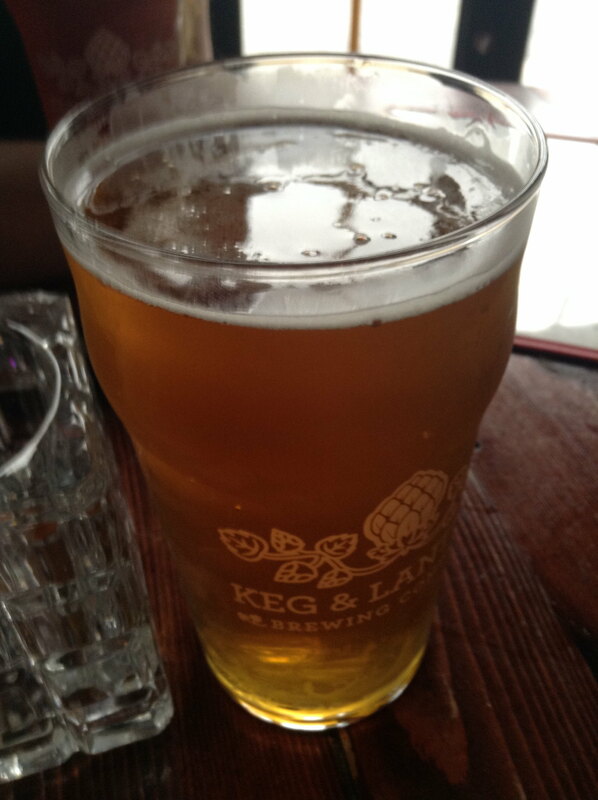 I also had a pale ale from Key & Lantern and enjoyed that, too. Harpoon UFO wheat ale; nose of light struck lager (peppery) and “no”. I think it’s old, I think this beer is not even close to its best. The papery aftertaste strongly suggests oxidation so…let’s pour it out. Peak Organic Amber ale; this is nice. It isn’t brilliant and it finishes in a way I can’t put my finger on yet. But there’s a very pleasant caramel malt thread running through the beer, start to near-finish. That finish has this waxy quality that is coating my tongue in an unpleasant way. It isn’t undrinkable but it isn’t great. Captain Lawrence Liquid Gold,-belgian style with spices. OK, so this is just a big ol’ glass of banana. It’s tasty banana. I would eat it as any kind of gorilla or orangutan. 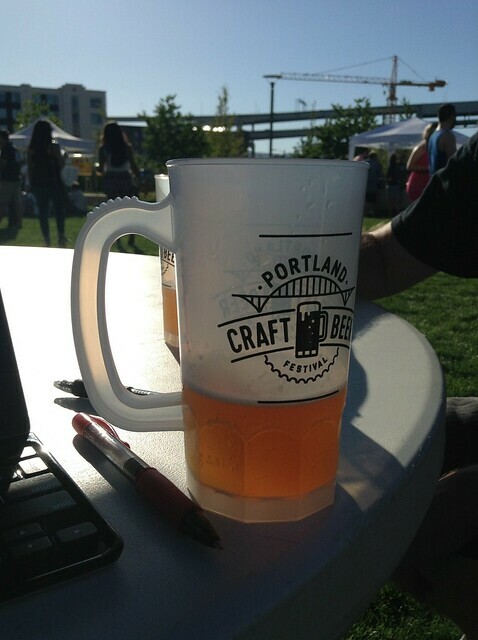 Next Post: I’m going to put up on Saturday, as I plan to spend Friday at the Portland Craft Beer fest. I’ll have notes from the event!